Eye Movement Desensitization and Reprocessing (EMDR) is a form of psychotherapy that is designed to help clients deal with the emotional anguish that stems from traumatic life events. EMDR is an evidence-based and research-backed therapy that has shown to be effective for treating PTSD and other forms of trauma. This therapy is officially recognized by the World Health Organization and the Veterans Administration among other groups. By addressing the emotional pain in an effective manner, and removing entrenched mental blocks, the client can move toward healing. In addition to being a productive treatment for post-traumatic stress disorder (PTSD), EMDR can also be used to treat anxiety, depression and other common mood disorders. As an experienced EMDR practitioner, I guide clients through the process and help them achieve the best results possible. There are a total of 8 phases used in EMDR therapy. The therapy itself incorporates multiple components for maximum effectiveness, and focuses attention on the client’s past, present and potential future. 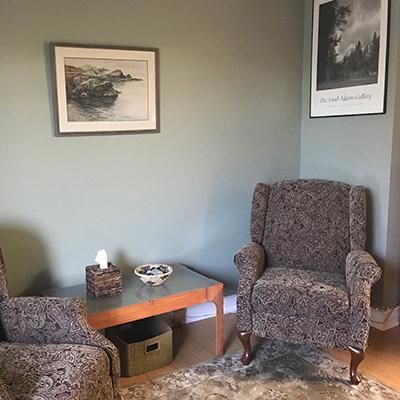 When clients come for EMDR treatment, we address painful memories from their pasts as well as present-day events and circumstances that have become problematic. I also help them to develop critical skills that are conducive for forward-thinking, positive actions. During the initial phase of the EMDR therapy, we discuss your personal history and pinpoint specific sources of emotional pain to work on. This first step is of vital importance, as it allows me to establish a comprehensive treatment plan to best suit clients’ particular needs. Please note that the length of treatment necessary is linked to the number of traumatic events as well as how long the emotional distress has been present. Once this first phase is complete, we go over useful strategies and techniques for managing stress and emotional pain that will come into use both during and after treatments. The core of EMDR treatment encompasses phases 3 to 6, and it is during these phases that we work through the memories and experiences that are distressful. For each memory that we address, the client comes up with a visual image closely associated with the memory along with a negative belief about him or her, linked emotions and physical sensations, and a belief that is positive. As the client plays close attention to the negative images, thoughts and sensations, I have them use their eyes to follow my hand as it proceeds from one side to the other or will otherwise use various taps or tones. The purpose of this is to allow them to successfully process the painful memories and associated feelings. This stimulation repeats, and over time a transformation occurs as the pain is processed and the positive belief helps to shift the overall meaning of the traumatic event. The overall goal is for the memory to no longer cause distress as the client from negativity to positivity and empowerment. This process is then repeated for additional negative memories. As each session closes (Phase 7), the client is instructed to pay attention to thoughts and emotions that come up between sessions and write them down. The final phase (Phase 8) takes place at the start of the next EMDR session and involves a close look at how the treatment is proceeding to determine what adjustments, if any, are needed. EMDR is being used more and more as a means of addressing post-traumatic stress as well as other sources of emotional pain that cause individuals to struggle. The therapy is backed by a multitude of scientific studies and research, and has been used to help millions of men and women across the world. If you’re interested in learning more about EMDR therapy, or would like to schedule an appointment, please give me a call at (818) 852-7077 or fill out the contact form on this page. Certified EMDR Therapist serving Agoura Hills, Calabasas, Malibu, Oak Park, Westlake Village, Thousand Oaks, Newbury Park, Camarillo, Moorpark, Simi Valley, Oxnard and Ventura areas.